The UK’s longest serving firefighter has been recognised with his county's High Sheriff Good Citizen’s Award for his distinguished service at Shropshire FRS. Former Mayor of Market Drayton, Roger Smith has been a member of SFRS for a record 47 years, making a “substantial contribution” to the safety and well being of his local community during that time. Upon receiving his award, Smith said: "It’s unbelievable how the years have gone by but it has been a very enjoyable experience. I’ve met an awful lot of people and been to thousands of fires and other incidents, too many to remember." Having joined Shropshire Fire and Rescue Service on March 14 1967, Smith progressed through the ranks, being promoted to Leading Firefighter in 1972, Sub Officer in 1983 and Station Commander in January 2008. Smith is still officer in charge at Market Drayton fire station where he is on reduced duties after undergoing a major operation. 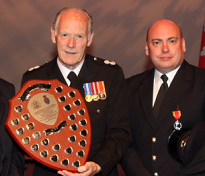 Chief Fire Officer John Redmond said: “He has dedicated 47 years to Shropshire Fire and Rescue Service and is believed to be the longest current serving firefighter in the UK. During his long career he attended many serious incidents including the Tern Hill Barracks Bombing in 1989, Cox’s Chemicals fire and both of the COD Donnington fires. One of Smith's sons Mark (pictured together above), a crew manager at Market Drayton fire station, also recieved an honour at the ceremony being one of 13 to receive Long Service and Good Conduct Medals from Lord Lieutenant Sir Algernon Heber Percy.